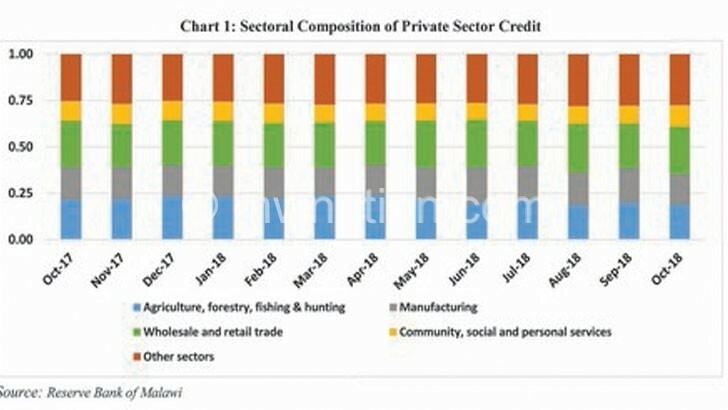 A market analyst has said while continued growth of credit to the private sector is positive news, the credit spread gives direction as to where the economy should go going forward. The sentiments follow continued credit growth to the private sector since March 2018 with private sector credit in October growing by K17.5 billion to K464.7 billion compared to a growth of K7.7 billion and K7.8 billion in September 2018 and October 2017, respectively, according to the Reserve Bank of Malawi (RBM) October 2018 Monthly Economic Report. According to RBM, in terms of economic sectors, credit expansions amounting to K12 billion, K11.1 billion, K5 billion and K3.8 billion were recorded in the wholesale and retail trade, community, social and personal services, real estate, and transport, storage and communication sectors, respectively. On the other hand, credit to the manufacturing, construction; electricity, gas, water, and energy; and agricultural sectors contracted by K7.7 billion, K4.1 billion, K1.7 billion and K1.4 billion in the month, respectively. services sectors claimed 20 percent, 17.6 percent and 12.3 percent of the total outstanding credit stock, respectively. In an interview yesterday, market analyst Armstrong Kamphoni said while the trend could signify demand for the outstanding sectors, it could also mean that due to their risk averse, banks are shunning them. He said: “This tells the story of where the country is and where the country needs to go economically. Because it means there is demand for retail, which means most of our entrepreneurs in the country are into trading and this might involve, to a larger extent, importing of commodities [I don’t know how much of that is exports]. But we need to be moving to areas like agro-processing and manufacturing as a country. Earlier, businesses had continued to decry government’s continued borrowing, which they said, was creating competition for funds for businesses, at a time production levels are dwindling due to reduced power generation. Treasury hopes to increase domestic funding to the private sector by among other things, the creation of Public Private Partnerships, establishment of specialised financial institutions and increased support to the agriculture sector.